Dealing in Fresh Salt and Smoked Fish as the sign says, The Meyer and Thompson Co., Inc. were in business at the Fulton Fish Market in New York City from 1910 to 2003, almost 100 years! Their location from 1914 to 1997 was here at 146-148 Beekman Street. Founders were Ernest A. Meyer and Louis W. Thompson. Ernest August Meyer (1870-?) filed a passport application in 1920 where he said that he was born 21 October 1870 in Verden, Province of Hannover, Germany, that he emigrated from Bremen, Germany, May 1877, and that he became a naturalized citizen of the U. S. in Brooklyn, N. Y., 24 October 1892. Louis W. Thompson (1882-?) filed a passport application in 1921 where he said that he was born 9 December 1882 in London, England, that he emigrated from Antwerp, Belgium, November 1888, and that he was naturalized in New York City 9 July 1918. Louis Thompson's passport application was witnessed by Harry Thompson (brother? ), employed at the Thompson Co., 150 Beekman St., New York City. The Thompson Co. was formed by Louis W. Thompson in 1917. He may have left Meyer & Thompson by that time. Polk's New York City Directory for 1917 listed only Ernest A. Meyer as an officer at Meyer & Thompson. The Thompson Co. was located next door to 146-148 Beekman St. at 150-152 Beekman St. This ad from the New York Tribune, 1919, shows them at that address. They were in business here from 1917 to 1939. Meanwhile, at Meyer & Thompson, Ernest Meyer may have died in the late 1920s, and by the time of Polk's New York City Directory in 1933-34, president of the company was Arthur Philip Wurmstich (1890-1952). In the 1920 U. S. Census as well as the 1925 New York State Census Arthur Wurmstich was head of household at 325 83rd St., Brooklyn, when Ernest Meyer was listed as a lodger/boarder in the home. By 1920 Arthur Wurmstich was already in the wholesale fish business. In 1952 Wurmstich was succeeded at Meyer & Thompson by his son, Arthur Philip Wurmstich, Jr. (1919-2001). Arthur Jr.'s obituary notice in the New York Times, 28 Oct. 2001, pg. A 20, read, "Virginia Beach, Va. -- Arthur Philip "Bud" Wurmstich Jr. died peacefully Oct. 6. He was 82. A memorial service was held Oct. 13 at 2 p.m. at the First Presbyterian Church of Virginia Beach. Born in Brooklyn, he lived in Mountain Lakes for 57 years. He and his wife Janet retired to Virginia Beach 18 years ago. He served in World War II with the 137th Infantry, attaining the rank of captain. He fought across England, France and Germany and was a three-time recipient of the Purple Heart. He also received the Bronze Star. 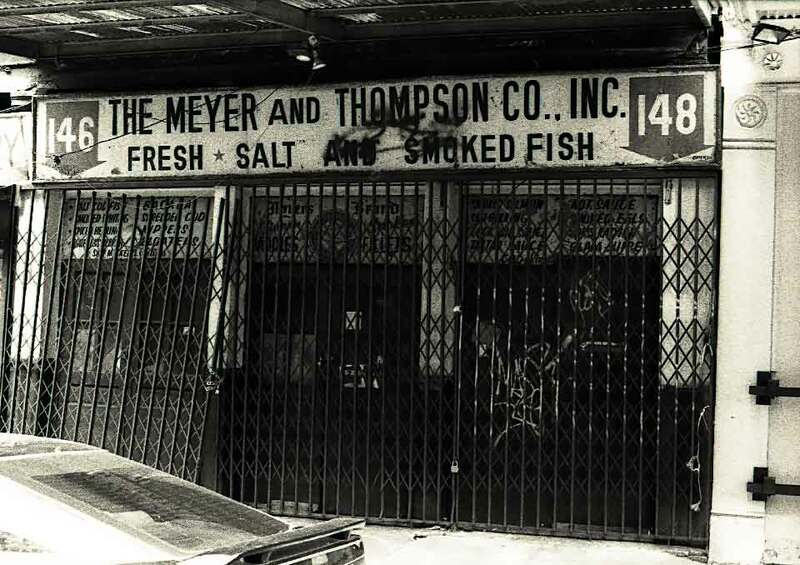 For 35 years, Mr. Wurmstich owned and operated the Meyer & Thompson Co. in New York City's Fulton Fish Market. After the war, he graduated from Columbia University in New York City. He earned his undergraduate and graduate degrees while working at Meyer & Thompson. ... Mr. Wurmstich, a devoted husband and father, is predeceased by his daughter, Susan and his sister, Roberta Kluhsmeier. Survivors include his wife of 54 years, Janet; daughters, Wendy Lee Lehner and Cathy Schmermund of Houston; son, Gordon Wurmstich of Bridgewater; and seven grandchildren." Regarding Meyer & Thompson, the following appeared in the New York Herald Tribune, 25 March 1941, pg. 22, "The Meyer & Thompson Company was the first to smoke cod chunks. Sixteen years ago codfish left on the market after the day's selling could be had for a penny a pound. Such a waste of fish worried A. P. Wurmstich, head of the firm, who began buying cod, cutting it into chunks, two tail pieces and a center, to smoke. It sold from the first and became increasingly popular, so flaky the flesh, so light the color."